Feel good story of the year! 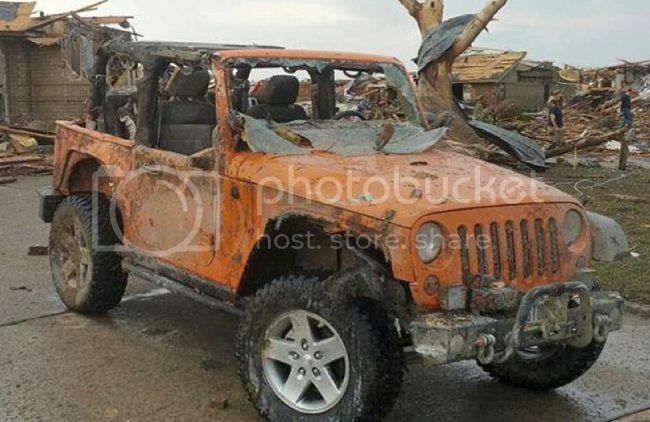 Stomper the Jeep barely survived the Moore, OK tornado. The truck's owner discovered the Jeep still ran. He cleared a path out of what was left of the garage, and used the damaged Jeep to help rescue people trapped nearby. Later, the insurance company said the storm damage made the vehicle a total loss. Crocker Off Road Performance in Phoenix heard the story of Stomper, and volunteered to rebuild the Jeep as a tribute to the resilient people of Oklahoma. Thanks for the links, love the story. Glad he gets a replacement and a rebuilt jeep! It doesn't look damaged to me, just the plastic fenders got ripped off and the windshield is down and a couple scratches, nothing worst then on the trails :smiley_drive: Take it to the car wash and call it a day. It just looks it came from a trail. Thanks for the story, a true hero in my eyes. It's amazing to see the heroism come out during natural and/or man made events. wow the people on jalopnik are pricks eh. Noticed the Ohio plates, from the article, he was visiting his parents when the tornado hit and the all hid in the fraidy hole. We just came back from visiting the In-laws in Oklahoma last week, we were down in OKC during the El Reno twister but far enough away just to get wind and rain. But back in 2005 we were visiting again, when a twister came close enough to knock of a Hackberry which part of it ended up on my Xterra. We used his farm jack to get the roof higher and we were able to drive it back to home to Ohio. Camp is badass dude, he's always looking for ways to give back to the community, and this is just one build he's done along these lines. If I ever wind up in Phoenix, I know who's getting to work on my rigs. I listen to a weekly Jeep related podcast. They generally try to have an interview every week or two. This weeks interview..... Bryan Hutton, owner/operator of Stomper.